This cultural note offers my sudden inspiration for how to better mount an orchid that is growing in a small pot (or basket). 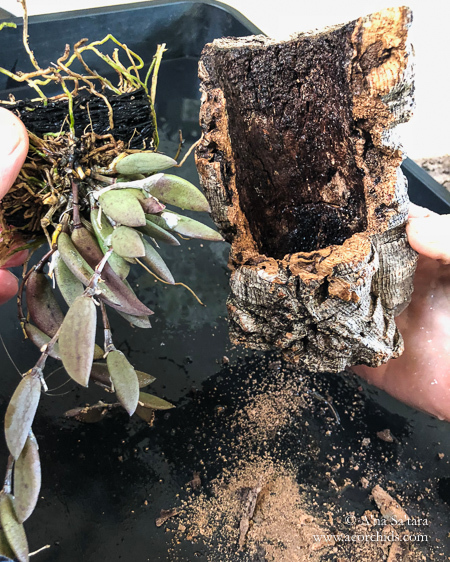 I came upon this innovation while burrowing through my pieces of cork bark, looking for the right size and shape piece for a Dockrillia (Dendrobium) rigida that had been growing in a basket. This orchid had been in a wood basket for several years, and reached small specimen size (for a miniature orchid, that is). The basket began to fall apart, so we placed it in a larger basket. However, the orchid began to decline. I suspect the deteriorating wood was no longer suitable for its roots, and the basket within a basket further reduced air flow. In any case, it was time to do something different. Upon dismantling the baskets, we reduced the healthy part of the orchid to a core chunk of tree fern. It seemed more natural for the growth pattern of the main “branches”, and more aesthetically pleasing, to mount it rather than try a new basket. Hence the initial hunt in the cabinet for an appropriate piece of cork to attach the tree fern chunk, and allow the orchid to re-establish as a vertical mount. As I was picking out a couple pieces of cork slab, I noticed my odd purchase of several largish cork tubes. Bigger than anticipated when ordered and never used. One of the tubes had a piece missing, so there was a 5″ half circle (see photo). With a bit of trimming, I wondered if we could insert the tree fern chunk into the opening? With a bit of filing and cutting a piece from the 2 foot length of tube, we had a very attractive and functional new mount. The canes could cascade over the front, and the roots could extend down into the tube, providing some extra humidity and wind protection during the summer while still being quite airy (see image at top of page). This worked so well, we found another application for a Dendrobium unicum in a small pot. 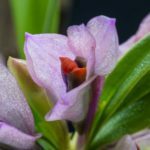 I purchased two Dendrobium unicum, one mounted and one in a small pot. 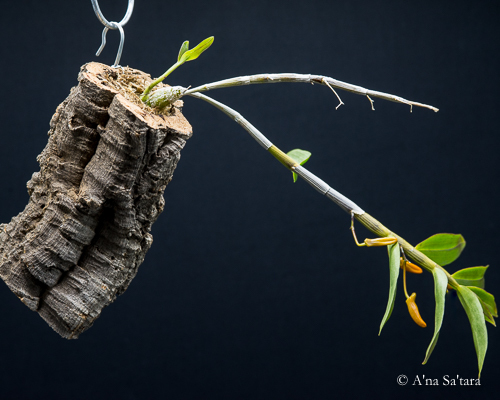 After a year, the mounted orchid had far exceeded the potted one for growth and flowering (see the bloom photos here). 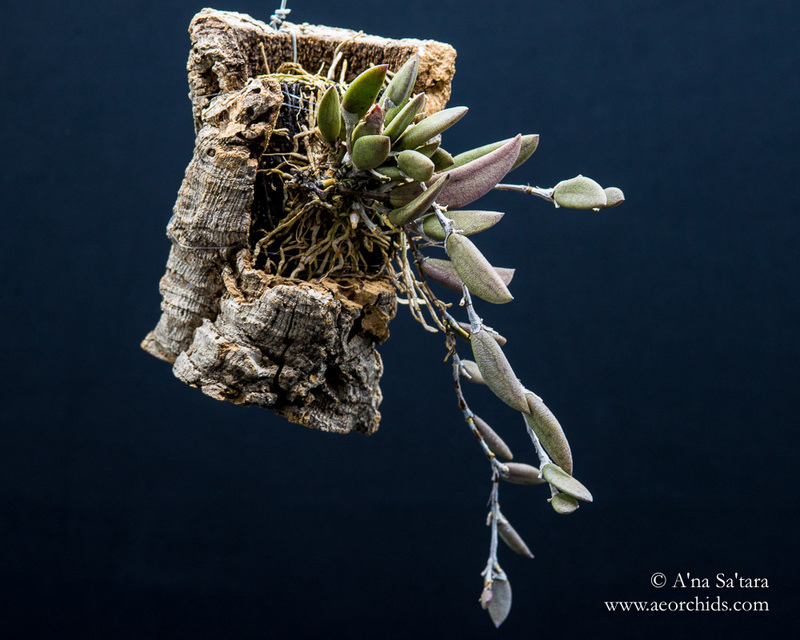 Looking at the mount, it was clear that the orchid was able to grow a more extensive root system on the mount compared to the pot. This was somewhat surprising, as most of our outdoor orchids grow better in a basket or pot, since humidity can become rather low in the summer (30-40%; even lower in fire weather). We could have re-potted into a larger pot for more root space, but the pendulous nature of the canes made a mount a better choice for the long term. This was a simple setup: we cut a 6″ piece of the widest diameter cork tube and inserted the root ball — it just fit. I added a bit of green moss to fill in the spaces so that it was snug. 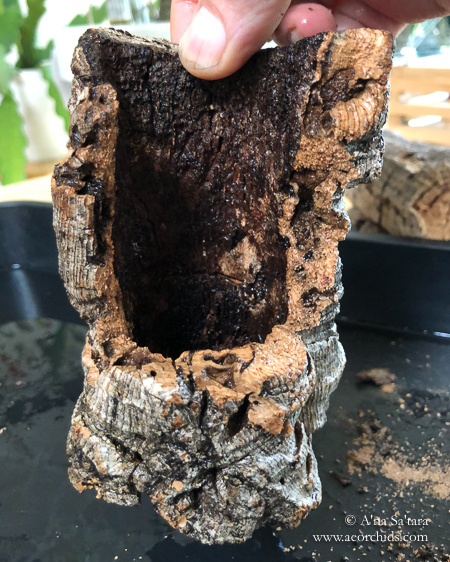 Both of these results were much better than strapping the root ball or tree fern piece to a slab mount — both visually, and less disruptive to the roots accustomed to a container. As with all re-mounts or transitions from pot to mount, it is easier with a smaller plant or division. 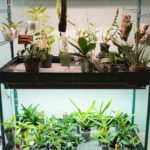 I’ve noticed some orchids resent having their growth orientation changed after being established. Sometimes they stop growing for awhile, or restart in another aspect/direction, allowing the original piece to decline. 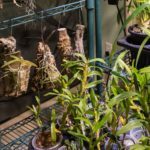 I’ll update on the growth of the Dendrobium unicum at the end of the season; the Dockrillia rigida is already growing much better.